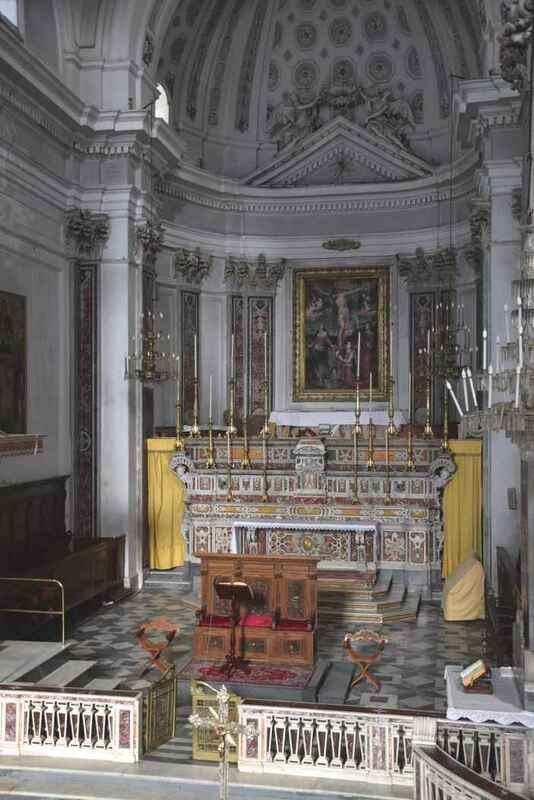 Once dedicated to Saint Croce and the virgin and martyr Saint Trofimena, the cathedral was from 987-1818 a.d. The original building, which was an early Christian cathedral was damaged and subsequently rebuilt between the XVIII and XIV century. The old temple was demolished in the middle of the XVIII century because it was crumbling and only two aspes remain. It must have faced from east to west, orthogonally in respect to the present temple. The actual building of the cathedral was started while Sylvestro Stanò was bishop of Minori. He was an ardent supporter of the building of the cathedral and the construction lasted until the following century. The cathedral was constructed in the form of a Latin cross and has three naves, a transept, crypt and belfry, built in the first half of the nineteenth century, which was the same time as the whole complex was finally completed. 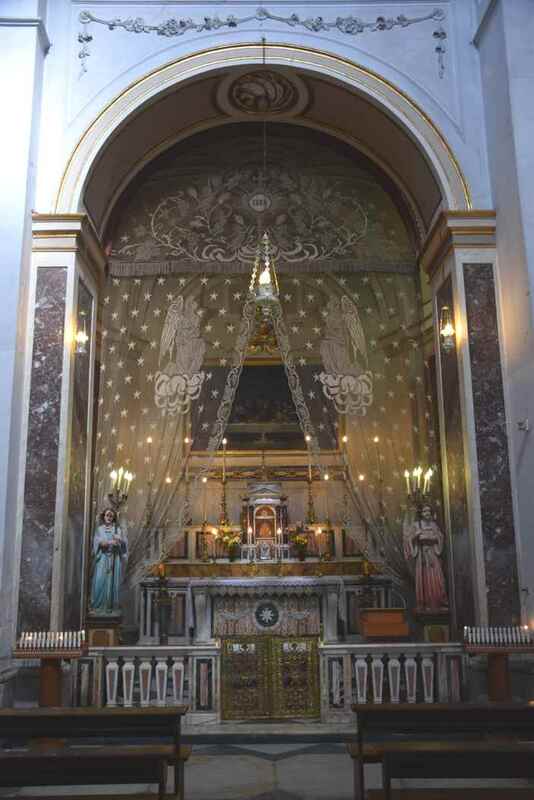 It was based on the model of the church of the Madonna of Carmine, a Neapolitan church. The plan of the church was quadrangular, neoclassical in style. The bell tower is divided into three different styles with pillars and arched windows, from which you can see the big bells. Under the belfry there is a formex to access the street at the back of the cathedral. The fornex has an arch and a stone tympanum. There are also clocks on every side of the building that were added some years later. The main facade, from where you can see the sea har architectural elements and decorations, typical of the eighteenth century. 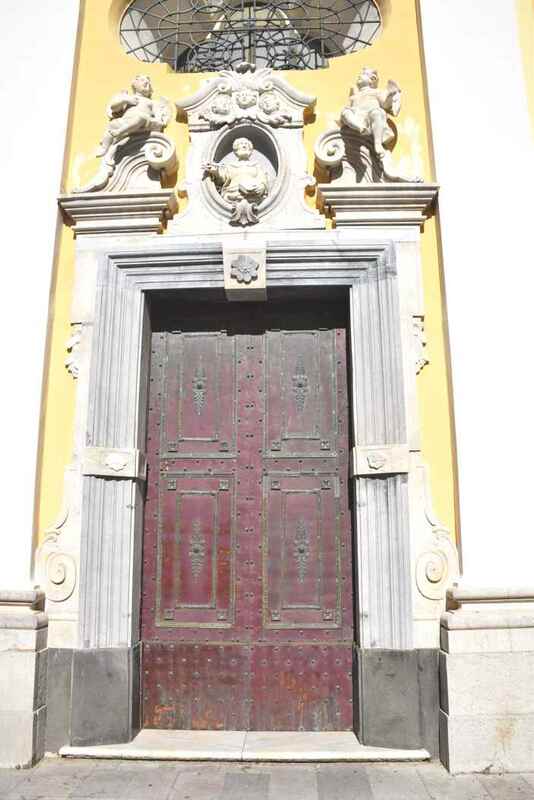 The main door is surmounted by cooing angels that are looking at the place were the image of the Saint is. The angels are a typical example of baroque architecture. At the same time on the two side doors,there are two oval niches with the image of the apostle Peter on the left and Paul on the right. Only in recent years have four more niches been built between the pillars where the statues of the four evangelists are. The central point of the facade is connected to the other facade by two arhes. It has fours pillars with capital Corinthians that face the side of the main window. The final area of the facade begins in front of the trabeation, it is narrower than the first. Typical of most buildings of period, it is above the church ceiling. Inside the main entrance, we can see a picture showing: Saint Andrea, Trofimena and Matteo, patron Saints of Amalfi coast. 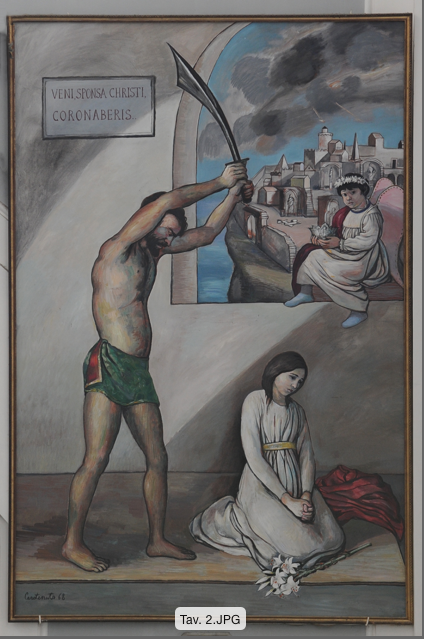 Beside them are two recent pictures by Mario Carotenuto that show martyrdom and discovery of the urn in Minori, two important episodes from Saint Trofimena's life. Inside it's full of plaster decorations in the late baroque and neoclassical style. These decorations give the tourist an airy impression perhaps because in addition there is coloured marble. Big pillars divide the naves. They form four spaces on; in every space there is a little churh. The decorations are beatiful. 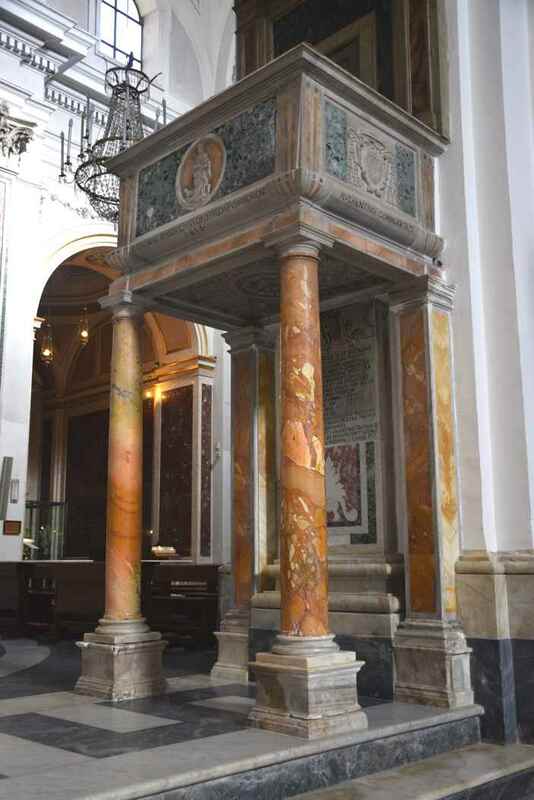 In the main nave there is a marble pulpit, standing on two columns, made in 1616 by Tommaso Brandolino, the bishop of Minori. The main nave is covered by barrel vaults and divided by two arches, linked at the base by a web and lunettes where there are four big baroque windows. These features all stand twelve metres above the trabeaton. At the end, where the transept finishes, there is a triumphant arch that displays the Minori coat of arms. 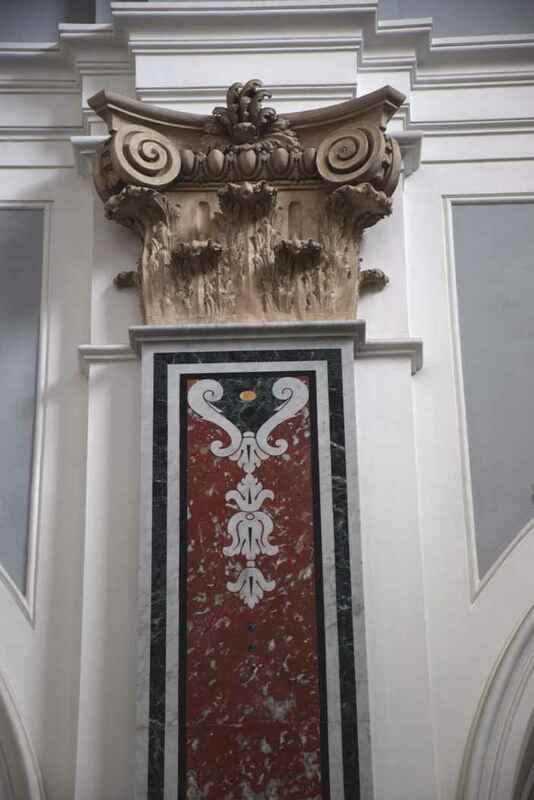 On a keystone in the transept, we can see a large coloured marble altar by Tommaso Borrelli, from Naples over this a picture of the Archangel Raphael with little Tobia, painted by Marsi in 1833. 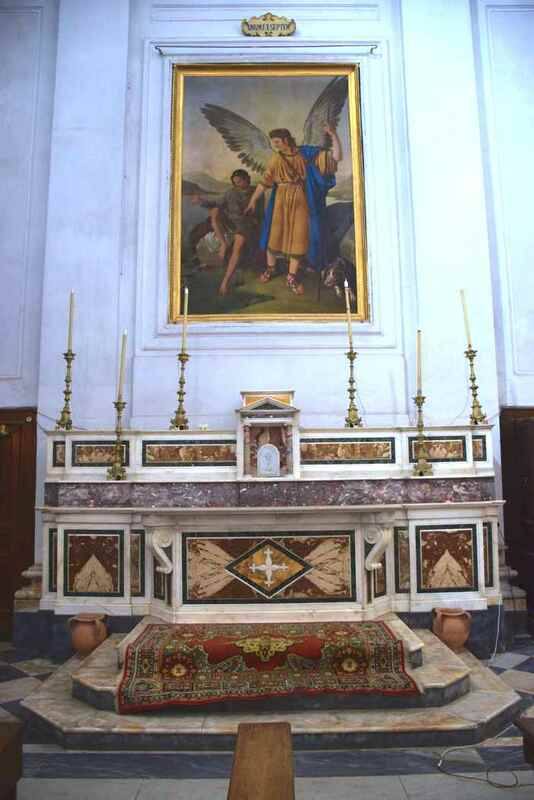 On the opposite side there is a different coloured marble altar with a picture of Saint Alfonso de Liguori, painted in the same year. There is also a beatiful dome between the two altars with a diameter of 10 metres that is drum less and based on four big arches, supported by another two arches. The plan of the churh forms the passages that, in turn creates these spherical shapes. A base of copola surrounds the dome, its eight sides decorated with ceiling tiles in the "Ravenna" style. The presbitery is flanked by two chapels that lead to the transpets and then to the side aisle. On the left there is "Specie Eucaristiche" and also the Adoration, a beatiful picture that depicts the last supper. The positioning of the people show this was inspired by Da Vinci. 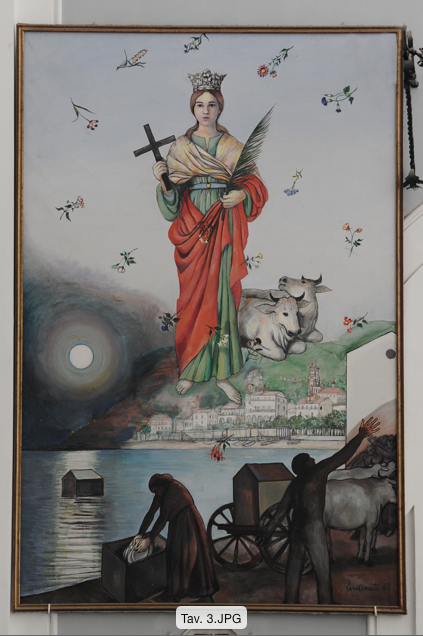 It was probably painted by someone from the school of Andrea Sabatini from Salerno. In the right aisle, however there is the wooden sarcophagus and yhe image of Christ's death. 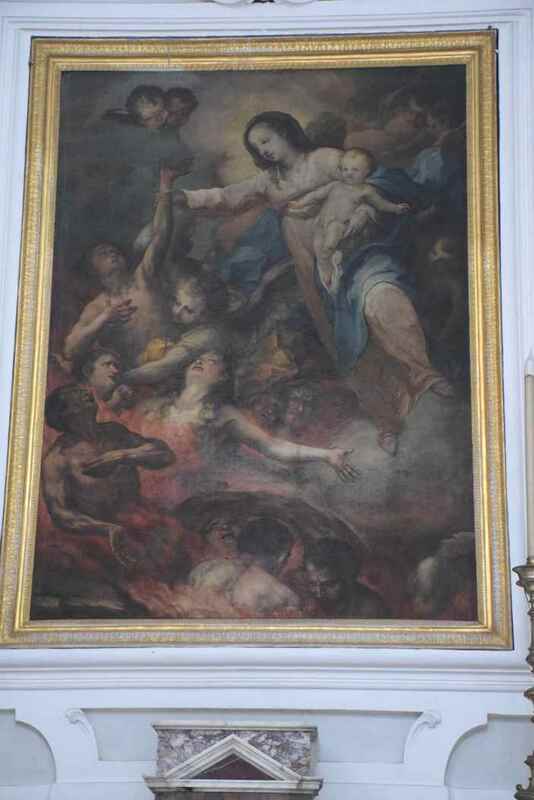 High up at the back, there is also a picture showing Christ's resurrection painted in the eighteenth century by someone from the Neapolitan school, perhaps Marco Pino from Siena. In the presbytery there is a solemn altar in proportion to the interior of the cathedral it is 16.60 metres long and 10.60 wide and covered by a barrel vault in the first half, and in the semi-spherical bowl is decorated by stucco. 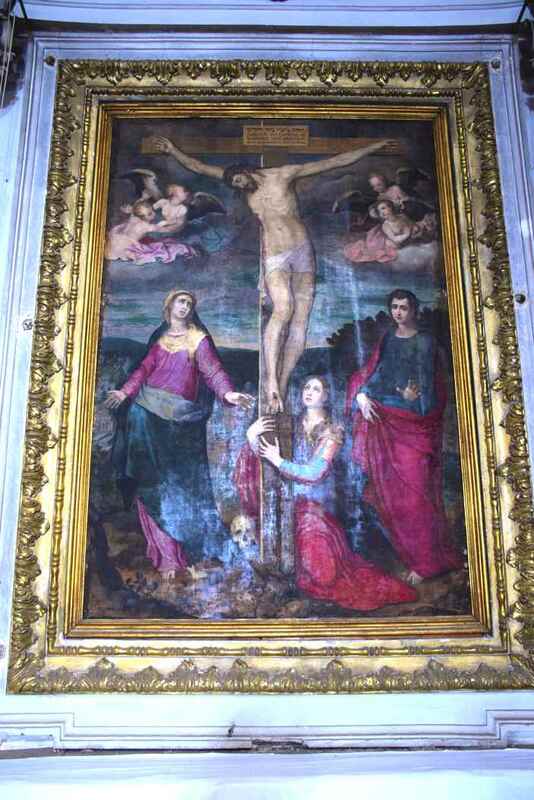 Above the altar is a picture of artistic value by Marco Pino (a520.1596/8) it has been recently restored. 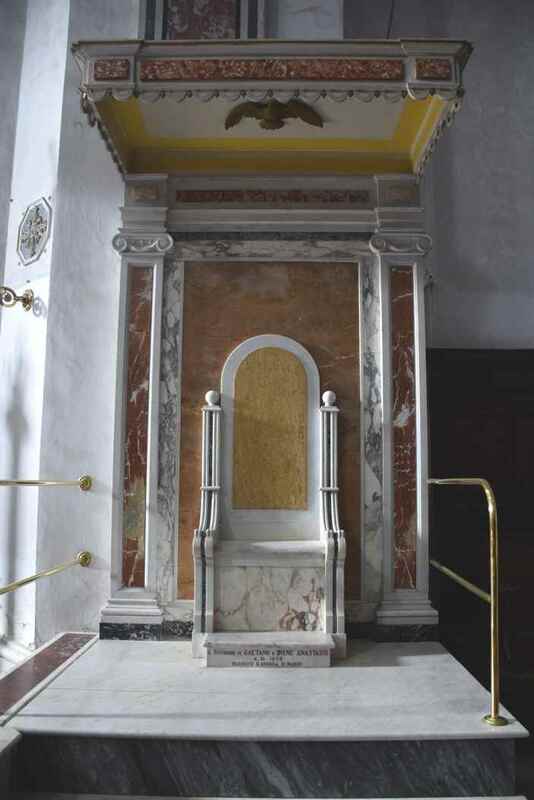 Even the bishop's throne is interesting, it is made from white marble with a canopy and four nearby chapels, one for each nave. The first chapel on the right is the most interesting. Inside there is a picture showing the Madonna with Baby, between Saint Leonardo and Biagio. This was the seat of "Monte di Mutuo Soccorso of Santa Maria of Porto Salvo" of 1610. 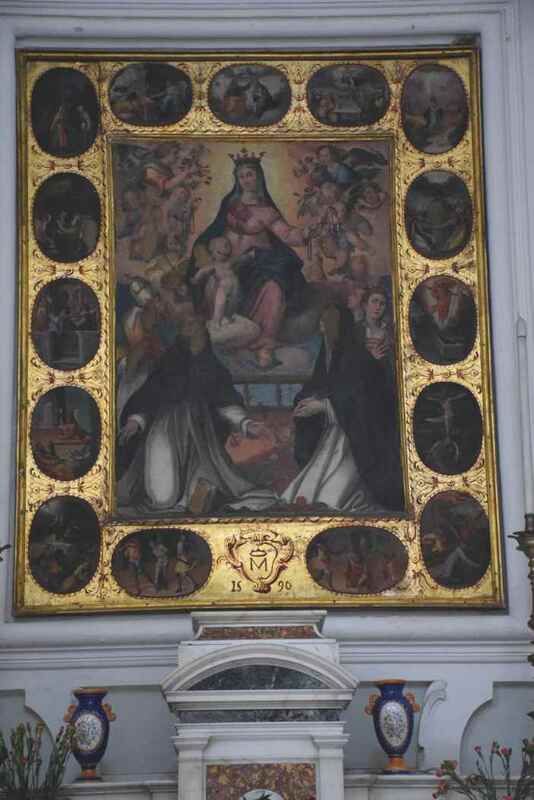 In the fourth chapel on the left, there is a picture, painted in 1590 that shows the Madonna of Rosario between Saint Katherine and Domenico. It also shows the fifteenth ministry of Rosario. The crypt is a real architectural jewel. It has two sets of stairs that start from the presbitery. There are three small naves and a transept connected trough the dome. This part seems as if it is a cathedral in itself. The crypt was rebuilt in the nineteenth century. Barrel vaults cover the naves. In the altar here is the urn made of alabaster from Volterra. Sculpted by Gennaro Ragozzino, in 1794. 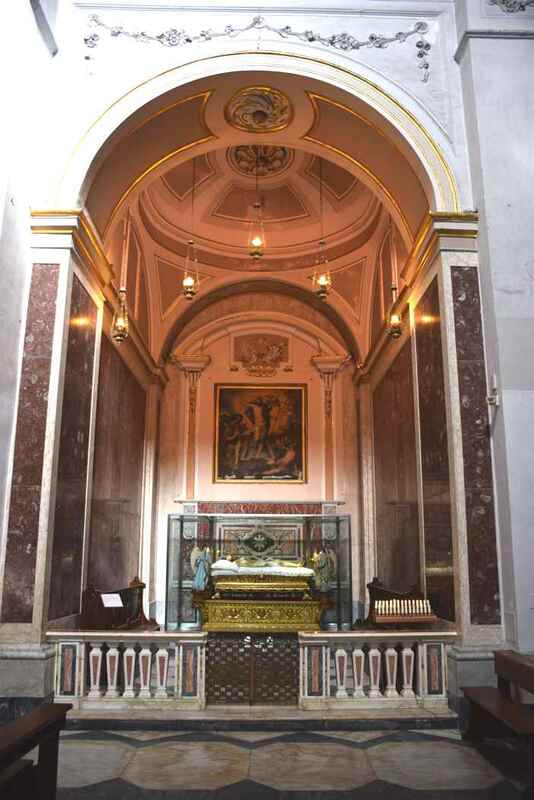 It contains the dead body of the Saint Trofimena. 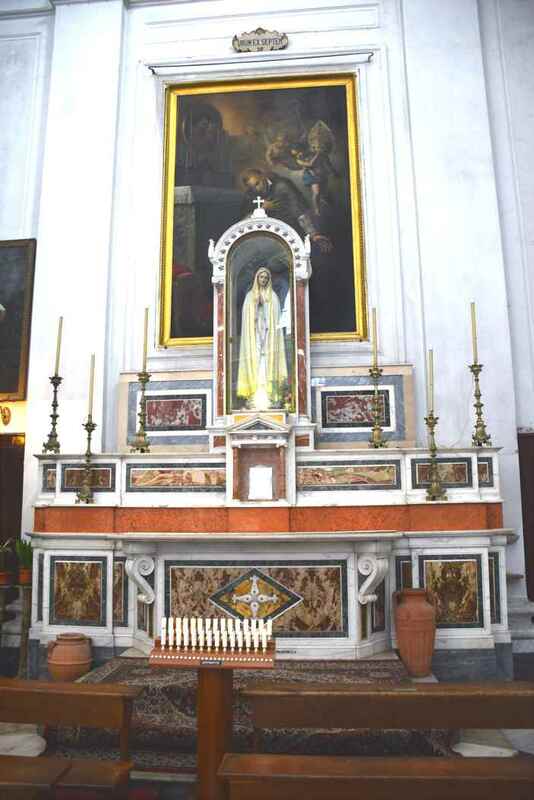 The statue and the altar were made by a sculptor from Ravenna in the 1950s. His name was Mario Casadio.